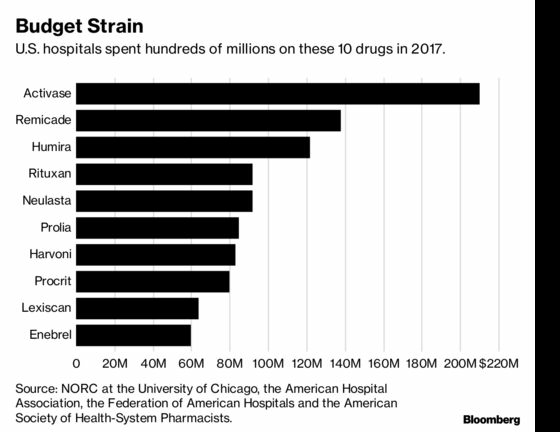 (Bloomberg) -- Rising costs of prescription drugs have strained hospital budgets and operations, forcing health systems to cut costs by reducing staff, a new study found. Drugs associated with outpatient care, which includes emergency room visits and other short-term services, were the most costly. Outpatient drug spending increased 28.7 percent per admission, while inpatient spending grew by 9.6 percent. Price hikes that affected hospitals were seen across various classes of drugs, including anesthetics, nonoral solutions and chemotherapy. The report comes as pharmaceutical companies are under increasing pressure from the Trump administration, Congress and insurance companies over rising drug costs. Drugmakers boosted list prices on hundreds of treatments this month alone. Last week, President Donald Trump summoned his top health officials to the White House to discuss the increases, while lashing out at drugmakers on Twitter. The number of drugs in short supply in the U.S. has skyrocketed since 2017, when there were 146 shortages, according to the American Society of Health-System Pharmacists. Already, the ASHP has identified 250 active shortages in 2018 -- and Fox and her colleagues are still counting.